Alok Vaid-Menon, performance artist, sharing a personal testimony. 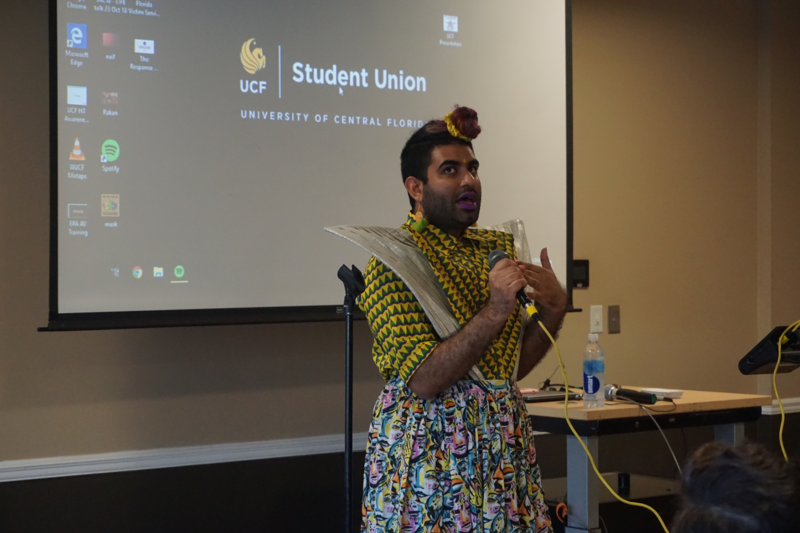 A performance artist Alok Vaid-Menon put on a passionate performance for Transgender Day of Visibility at UCF Thursday evening. Vaid-Menon shared personal poems as well as personal testimonies of experience as gender nonconforming, to a room of over 40 people in the Student Union. Vaid-Menon’s presentation covered a variety of topics such as satire, racism, alienation, politics, and identity. “Any day in New York City I’m just dressing as myself, aka better than anyone else, and I get multiple people pushing me down, people telling me to die, and people trying to push me in front of trains,” Vaid-Menon said. Vaid-Menon said the number one issue facing transgender people is murder, not hormone treatment. Chrissy Crabtree, a non-binary trans-masculine, sophomore psychology major said they were pleasantly surprised at the powerful poetry Alok had performed. Crabtree said they were also happy Vaid-Menon covered the subject they said isn’t widely understood, the differences between nonbinary and gender nonconforming. Vaid-Menon elaborated on the experience effectively coming out to their parents. “Gender non-conforming means you visibly defy what society considers a man and a woman, and often time this is because they’re gender non-conforming, it’s the reason people experience the most transphobia,” Vaid-Menon said. Vaid-Menon shared that over 60 percent of transgender people of color attempt suicide. “A lot of us [trans-community] are fighting for the right to exist in public,” Vaid-Menon said. Daniel Hernandez, a sophomore English literature major shared what he took away from the presentation. Vaid-Menon said using basic words of emotions to convey feelings made all the difference and felt more understood than trying to convince or debate using technical terms. “We need to begin with the vocabulary of emotions, rather than the vocabulary of politics,” Vaid-Menon said. Vaid-Menon said conforming to gender roles and “small boxes” leads to violence. Vaid-Menon said what they envision the world with choosing one’s identity.